Thousands of women globally still have TOXIC, NON•COMPLIANT, HIGH RISK, Category III, implantable Medical Devices in their bodies! Or, they are suffering from recurrent or persistent symptoms long after PIP have been removed. 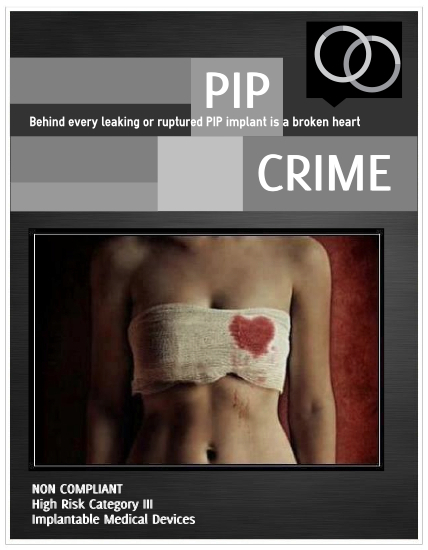 Many women report physical and mental consequences of leaking or ruptured PIP implants. The time has come to STOP the discrimination! This is NOT a debate about cosmetic surgery! A French tribunal ruled on the civil case brought by victims of the PIP implant fraud in Toulon on Thursday 14 November 2013. The court found TUV, (the German notified body) who repeatedly awarded a CE safety certificate to PIP, failed in its obligations of inspection and vigilance and was ordered to pay damages to the victims. TUV is Appealing the decision. JC Mas & staff from PIP were found guilty of criminal charges in Marseille 10 December 2013. JC Mas is facing a 4-year prison sentence pending Appeal. This is the first of three criminal cases being made against the 74yr-old criminal conman. Following a thorough toxicological review on the properties of the two most studied siloxanes, D4 and D5, the conclusion of the SCENIHR is that these compounds are of low acute and chronic toxicity. The European Commission’s Scientific Committee on Emerging and Newly Identified Health Risks (SCENIHR) today (29 October 2013) published their report on the safety of PIP breast implants. Their findings support the findings of the report of Professor Sir Bruce Keogh’s Expert Group on PIP breast implants which was published on 18 June 2012.
there is currently no convincing medical, toxicological or other data to justify removal of intact PIP implants as a precautionary approach.